Prague is without a doubt one of the most beautiful cities in the world. It is conveniently located in the heart of Europe at the crossroads of several cultures and is itself becoming more and more cosmopolitan every year. During your stay here you will also have the unique opportunity to comfortably explore other European countries nearby. The city of Prague is a significant centre of both filmmaking and studies. It hosts one of the largest and oldest film studios in Europe, which neighbours our school, and is also home to the 5th oldest film school in the world - the National Film Academy FAMU - which is still considered one of the best European film schools today. With affordable tuition fees and living costs, Prague is a dream city for every filmmaking student. Prague offers a vibrant and colorful cultural life. The city is cosmopolitan, welcoming to foreigners and offers a thriving home for students, thanks to its combination of western standards and low prices. The Prague streets are alive with fairytale charm and its city centre is listed in UNESCO cultural heritage for its rare aesthetics and unique architecture. The Prague atmosphere has imprinted upon the works of many famous personalities, from Mozart to Kafka or the Czech Oscar-winning directors Milos Forman and Jiri Menzel. Prague is surprisingly cheap when compared to other countries of Western Europe. The average cost of living for a student is generally about 400 EUR (12,000 CZK) per month including accommodation, food and public transport. The Czech Republic is a member of the European Union but the national currency is still Czech crowns. The Czech Republic offers some of the best education in the world, ranked in the top 20 countries internationally. Today, over 42,000 foreign students study in this country. Czech Republic is a very peaceful nation. It has one of the lowest crime rates in Europe and according to The Institute for Economics and Peace it ranks as the 6th safest country in the world. 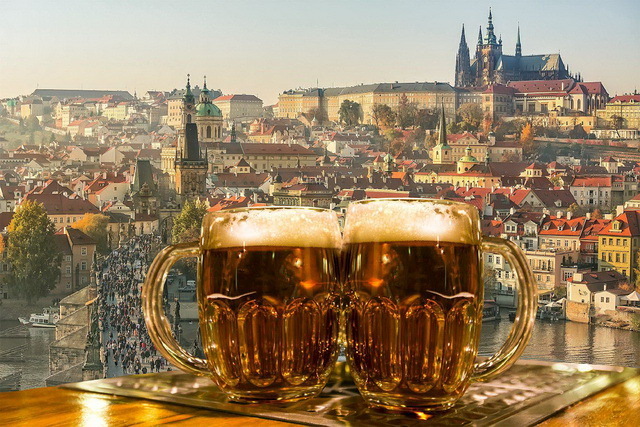 The Czech Republic is famous for consuming the most beer per capita in the world. The first written mention of Czech beer brewing is from 993, but it is generally accepted that regional brewing traditions go back to the first century AD. This is the birthplace of Pilsner Urquel beer along with a variety of different beer styles - from dark, malty dopplebocks and porters to hoppy pale ales and unique amber brews which mix dark and pale styles. A few brewers have even gone experimental, using all kinds of spices, fruits and other non-traditional ingredients. The longstanding saying still stands true today: In Prague, beer is cheaper than bottled water.